Increased short interest sent the in-flight internet stock plummeting last month despite solid third-quarter results. Shares of Gogo Inc. (NASDAQ:GOGO) dipped 26% in November, according to data provided by S&P Global Market Intelligence. The stock climbed following the company's third-quarter earnings release on Nov. 6 -- only to plummet 10 days later after the company detailed plans to offer $200 million in new convertible senior notes that will expire in 2022. Gogo's third-quarter earnings came in ahead of the market's expectations, but shares quickly came under pressure following news of management's plan to use the proceeds from its latest debt security offering to repurchase $200 million in outstanding convertible notes that are due to expire in 2020. 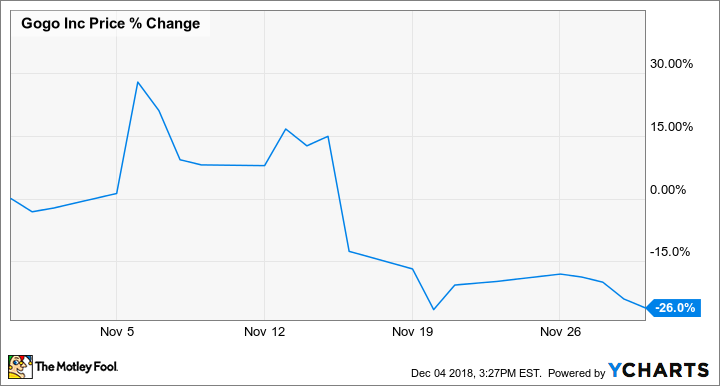 As covered by Motley Fool senior technology analyst Evan Niu, Gogo management was aware that repurchasing its existing convertible notes could have a significant impact on the company's stock price due to increased short interest. 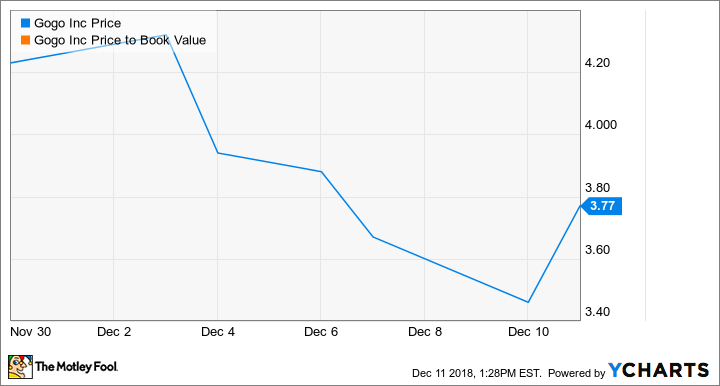 Despite the significant negative movement for the stock stemming from the new convertible senior note issuance, the development probably won't have a big impact on the company's long-term performance, and Gogo's most recent quarterly report arrived with some encouraging sales and earnings momentum. Its third-quarter sales increased 26% year over year to $217.3 million, and its loss for the quarter narrowed 17% compared to the prior-year period to come in at $37.7 million. For the full-year period, Gogo management expects revenue to come in between $865 million and $935 million, representing roughly 28.8% year-over-year growth at the midpoint -- in line with previous guidance. However, the company did raise its target for the year for adjusted EBITDA (earnings before interest, taxes, depreciation, and amortization) to between $45 million and $60 million, for roughly 111% growth at the midpoint -- and up from management's previous guidance for adjusted EBITDA to arrive between $35 million and $45 million. The increased adjusted EBITDA target came even as the company revised expectations for new 2Ku systems online this year to between 450 and 500, down from its previous target for between 550 and 650 new systems online this year.